I am so excited to start sharing some work from this awesome (and very hot) summer! I am not particularly a fan of the RVA heat but I have found that shooting in the morning is key for engagement or portrait sessions. It is simply more tolerable for everyone and the bonus of pretty incredible light as well! 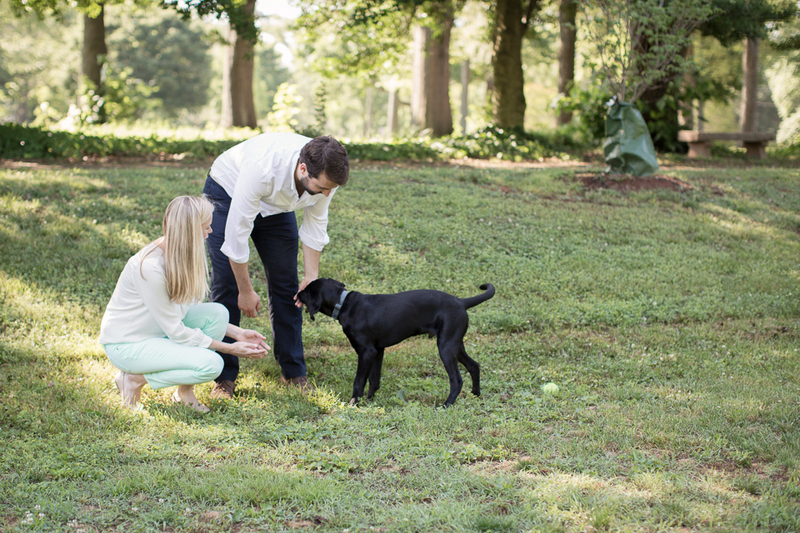 One of my morning engagement sessions this summer was my wonderful friend, Anne Bev and her handsome fiance, Burton. And not to mention, their deliciously cute puppy, Mr. Quincy! We initially decided to NOT make this a typical engagement session but rather more of a "Mr. Quincy Shoot"... simply focusing on a more lifestyle approach (more documented/less posed) and get some great shots with Mr. Quincy. This is totally my FAV type of shoot so I was so excited! During our session, Anne Bev and Burton were such naturals! They made the shoot look so effortless with their genuine smiles and Anne Bev's contagious laughter. I think my cheeks were sore afterward from smiling along with them! It is so easy to photograph these two.... they are just naturally beautifully, inside and out! Words cannot describe how excited I am to photograph their wedding at The Homestead later this October! I am so honored to be their photographer and I cannot wait to photography their big day! Thanks for a great morning, Anne Bev and Burton (and Mr. Q)!